This is Mr.Wilson. He is the bottom of a dead palm tree. 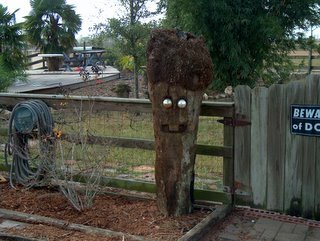 I found this huge dead palm tree and cut it into sections to put in my aviaries for my macaws. This was the part with the root ball and I thought it looked like a clump of hair, so I though about trying to put a face on it. All I had was a hammer and a chisel so it is rather a crude looking face. I put some Christmas ornaments for the eyes that were just holes when I carved it out. He guards the gate to our reflecting area by the pond.The beware of dog sign to the right should say beware of swans! Emmitt and Rosa Parks are on that side of the gate and they are attack swans! I can't wait to find another palm tree because I think I can make a better face with my drill and dremel tools. Free day, none scheduled! Lucky me. Very cute. Wonder if the animals look at it and say "huh!" Thanks guys, actually the animals look at it and piss on it.Think they're telling me what they think of my ysrd art?